March 4, 2016, 5:27 p.m.
March 4, 2016, 5:33 p.m.
really? the husky website specs the 240 as 10.3 lbs. maybe the one at canadian tire is a slightly different version. i know on their website it doesn't list a model so who knows, it may be a misprint. i'd still look into it just to be sure. low weight is one of the things i love about my ms192T. it's only 7lbs and a compact package and has a surprising amount of grunt for a small saw. they run the narrower chains though which don't last as long but cut a bit quicker as there is less material to move. the price is over $400. if the weight will be a concern then the stihl might be a better option. 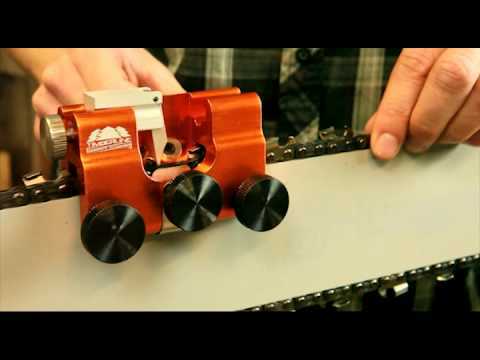 how are you planning to carry the saw, in a pack or on your shoulder? March 4, 2016, 6:13 p.m. Pack. Either hiking or riding in. I'm fine with the 170, sounds like it would work fine for what I'm planning, although I am curious as to what the $100 difference between it and the 180 is for. Some reviews seem to praise the 170, some say it's underpowered (although I question what they're using it for). It's certainly the way I'm leaning right now. March 4, 2016, 6:24 p.m.
yeah i'm sure you'll be happy with the 170. like i said though, learn how to sharpen a chain properly and definitely use a file guide or the little roller guides you can get. March 5, 2016, 7:47 a.m. I think I would go with one of the small Stihl saws over the Husqvarna 240. The 170 and 180 are proven saws and hold up well. The 180 would probably be my choice. March 5, 2016, 7:55 a.m. Speaking of saws, I got to look at a Husqvarna 3120XP yesterday. $1900 and 118cc of pure awesome. March 5, 2016, 2:20 p.m.
Any reason for the 180 over the 170? It's a significant price difference for what doesn't look like much on paper. March 5, 2016, 2:49 p.m. I haven't run either saw but the specs on the 180 say it has a bit more power and slightly higher rpm. I'm used to a fast saw so I like all the speed and power I can get. Your shop may have demo models you could try out to see if you can feel a difference. I do prefer the standard bar nuts and tension adjustment on the 170. Simple and less weight is always nice. March 5, 2016, 3:07 p.m.
Do you have a Husqvarna dealer nearby? I was just looking at the flyer I picked up and they are doing the 435 for $311.99 reg $389.99. 41cc 2.15hp and 9.2lbs. March 5, 2016, 3:29 p.m. There is a dealer just down the road, I'll check it out as that's a fantastic deal for what looks to be a great saw. I'm in oil country though so it seems that everyone jacks prices up just because they can, even with the current problems with the job market. Where did you see the flyer? March 5, 2016, 3:37 p.m. I picked it up from a Husqvarna display booth at a outdoors show I was at last night. I don't see it online yet so it must be brand new. It says prices are good until June 30th 2016 and seems to be for all of Canada. March 5, 2016, 3:38 p.m. Awesome, thanks. I'll check out the local shop on Monday. Otherwise I'll probably save the money and go with the 170. March 5, 2016, 4:17 p.m. 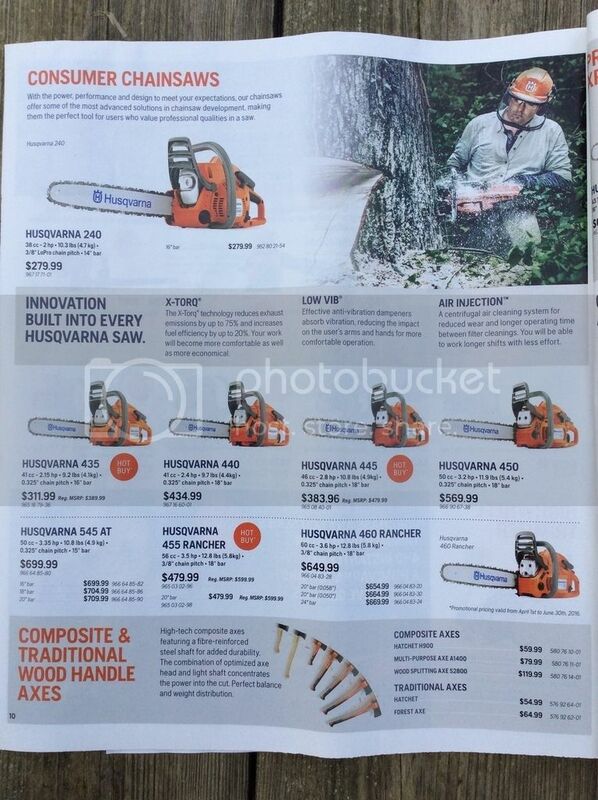 Here is the chainsaw page from the flyer. Sorry if the image is huge. I'm trying to do this on an iPad. March 5, 2016, 4:25 p.m.
No that's awesome, thanks. I'll bring a copy to the dealer. March 5, 2016, 5:54 p.m.
that 455 rancher is a smoking deal too and that is a saw that will do a lot of things.